A propos the post about Bike Lane Snowplough in Action, here's another bike lane being cleared of snow. This time it isn't in Copenhagen where the bike lanes HAVE to be cleared in order to accommodate tens of thousands of cyclists. The bike lane snowplough above is from the small town of Höör, in Southern Sweden. There was about 20 centimetres of snowfall last night in the area and the regular snowploughs were in action at steady intervals along the highways as we headed home from the summer house. But even in a town with a population of 7000, bike usage is high and the bike lanes are a vital artery and these smaller snowploughs clear the snow and spray fine gravel. 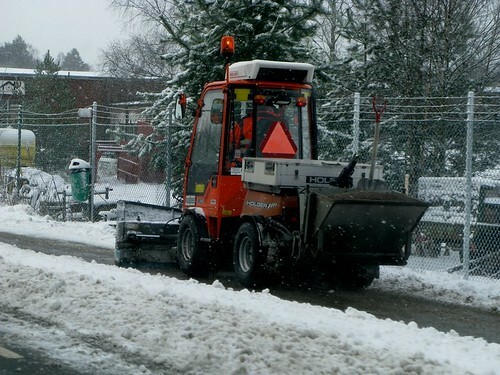 When a town of 7000 in a municipality of 15,000 has a bike lane snowplough - and I'll guess they have more than one, it seems odd that more larger cities don't.